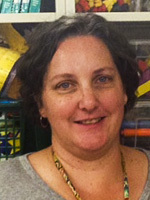 Helen Spruill is an early childhood educator in Brooklyn NY. This year she will be working as the K/1 Math Coach at PS 503. She holds a BA from Indiana University in English and History, and an MA from University of California Berkeley in Language and Literacy. She is also National Board Certified in English as a New Language. After spending years focusing on early literacy and language development, she is excited to apply what she knows about learning to elementary mathematics. She is learning to love math and enjoys sharing the joy of problem solving with students and teachers. She is particularly interested in helping early childhood and elementary school teachers better understand the math they teach, and is also interested in exploring how math learning in the early years dovetails with language development, especially for English Language Learners. She is currently pursuing a MS at Bank Street College in Leadership in Mathematics. She is extremely grateful to AMTE’s Math Specialist Scholarship for their assistance in her continuing education!